I joined IkamvaYouth in 2004 while I was doing my grade 11. In 2005 I was doing my matric. In 2006 I started to volunteer in the organisation while I was doing my first year at the University of the Western Cape. Since then I have been an active member in the organisation. In 2011 I started to work for the organisation. I am the first former learner to actually work for the organisation. I’m real happy to work for the organisation. Giving back to my community is very important to me. Never thought one I would work for this organisation. This also brought a change in my life. I studied Bcom Information systems now I am working as an administrator. While I was studying, I was hoping to work for private companies and never thought I would be working for NGO, but I am happy and satisfied to work for IkamvaYouth. Then I realised that you can study for certain field and working in different field and be satisfied. Ikamvanites across the country have been deeply saddenned by the terrible news of Dave Eadie’s sudden and shocking passing. Dave was instrumental in ensuring that every learner at every branch of IkamvaYouth has the Answer Series guides they need to achieve, improve their academic results, and access the post-school opportunities that’ll change their lives. 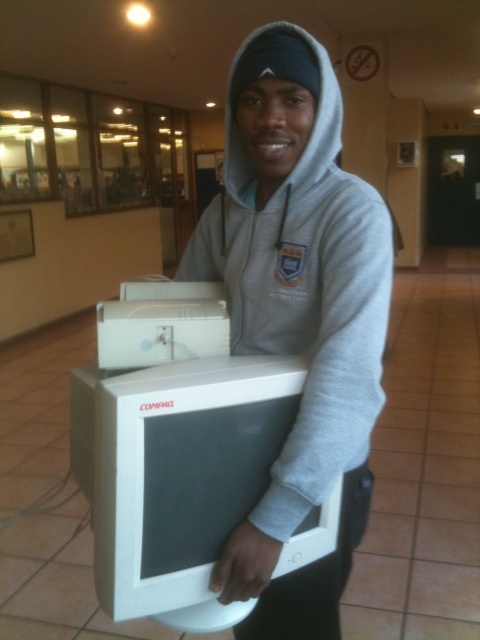 “I never met Dave, but he has touched the lives of the learners that I work with as part of IkamvaYouth. Our learners come from poor backgrounds and attend under-achieving township schools. 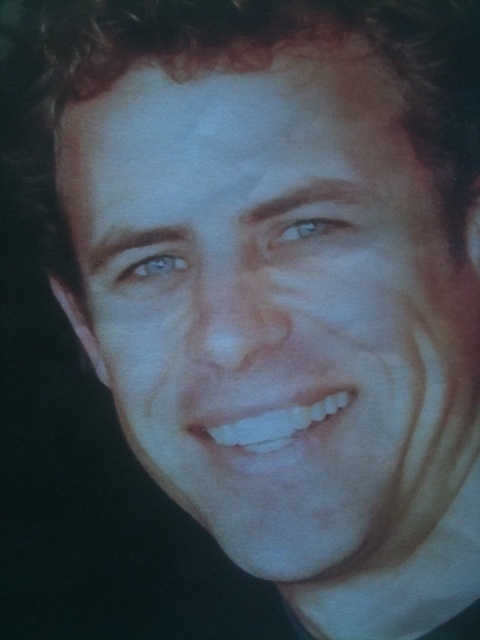 Through Dave’s generosity, our learners have had access to study guides that they otherwise cannot afford to buy. These young people’s lives are being transformed as they use these books to get themselves out of poverty and into tertiary. Thanks to Dave and the rest of the Answer Series team. “I was mostly too young, but perhaps more importantly, too apathetic and politically unaware to have played any meaningful role in the dismantling of the apartheid regime. Instead, I continued my relatively selfish existence, somewhat aware of the injustices around me, but largely in denial of their existence, and certainly with no strong enough moral conviction to actually do anything about it. The eventual dismantling of apartheid and relatively peaceful transition to a multi-racial democracy was hard won by the toil and suffering of thousands of South Africans (as well as citizens and leaders abroad), who cared enough about our country and its people to sacrifice small and large amounts of themselves and their lives to bring about the nation in which we currently live. However, although it was truly a miracle and much has been achieved in terms of reconciliation, human rights, infrastructure, much of the legacy of apartheid remains, and this is the single biggest de-stabilizing factor in our country, an unacceptable injustice that we live with on a continued basis, and which we must eradicate if we are to live in true harmony. Dave certainly played this role, and we thank him! Ikamvanites don’t let a little thing like a petrol bomb derail us from our big vision. In fact, like Zukile and Mphumzi say in the short film about the Freedom Day attack, more power to us! On 1 May, we spent the day at TSiBA brainstorming the first big challenge for sustainably scaling the IkamvaYouth model across the country: Where’s the $$ going to come from so that there can be an IkamvaYouth branch at every library, community centre and university campus that wants one? Freda Grey generously volunteered her time, wisdom and expertise to facilitate (and challenge!) the stretching of imaginations as far as our risk-averse temperaments would allow. Natcom members (Andrew, Khona, Zoe, Nombu, Nico and I), board members (Leigh and Colin) and branchcom members (Phillip and Naledi), as well as one of our advisors (Eugene Daniels, the District Director of Metropole South) brainstormed numerous income opportunities and identified the ones we’d like to develop further as potential business cases. We’ve set up a study group on the Peer-to-Peer University website for keeping the conversation going, and invite everyone with insight, opinions or ideas to get involved and contribute to the development of our strategy for sustainable scale. The day ended on a sombre note with Eugene describing the challenges that the Education crisis presents. He noted IkamvaYouth’s innovative approach, track record and potential for scale and emphasised the urgency for reaching significantly larger numbers of learners. Watch this space or get involved in this one! Masi SPW was a huge success! On 21st and 22nd May learners, tutor, volunteers and staff joined us at the Masiphumelele Library to talk, to listen and to think, think, think about how to move the Masi IkamvaYouth branch forward. How to un-lock the potentials of even more young people and how to improve the lives of as many people as possible. Everyone came with different expectations; wanting to know more about IkamvaYouth’s history; proposing new ways of partnering; presenting specific problems they wanted addressed; understanding how to be most useful as a volunteer; and how to move together in collective action. I hope no one was let down! There was an atmosphere of sleepiness that filled the morning air. Even Nico’s funky chicken didn’t seem to work. As people understood that what they were saying was contributing to the wider IkamvaYouth’s aims; the realisation of the bigger picture; they became engaged and animated. Ideas were flowing all around. The group was split into sub-groups to discuss core areas of tutoring, mentoring and community engagement. These categories were generated by an intense brainstorming of the burning issues. These task teams then identified the problems and started thinking about the solutions. On Sunday morning, with fresh faces and minds we launched into a history of the branch to better understand the roots and values of the organisation and the library. This was hugely valuable for the ‘newbies’ who got a wonderful overview from Susan Alexander here. It was in this frame of mind we generated an ambitious action plan for the next few months. 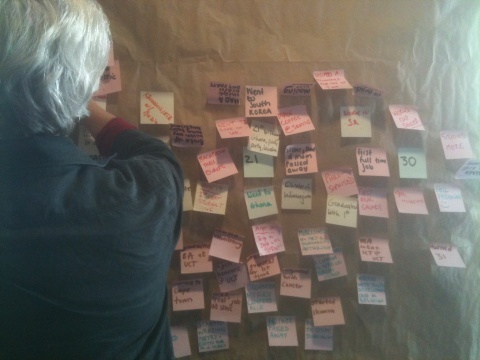 Ideas and suggestions were put into action and given deadlines and specific tasks. The responsibility all lies on the BranchCom members to be proactive and make it happen. I have complete faith in the team. Everyone came and showed phenomenal commitment and, I for one was inspired by the energy in the room. The 1st BranchCom will be held on the 2nd June to finalise these plans and make it happen! A special thanks to Pick n Pay for providing delicious sandwiches for the event to keep the energy up! Please see the spw_report.pdf for a detailed description of the discussions that took place. The Masiphumelele Drama Club wowed an audience at the book launch of Broken Promises on Saturday 14th May. A special request was made for the 4 Ikamvanites to perform a scene from the new book that is making waves in teen literature in South Africa. The new book is part of the Harmony High series that has been launched by Cover2cover books (www.cover2cover.co.za). The aim of the books are to excite young people in South Africa by providing relevant and applicable literature, particularly aimed at black youth. A culture of reading is paramount for South Africa if youth are to develop into the leaders that are so needed. Broken Promises and the team make a huge step toward making this happen. 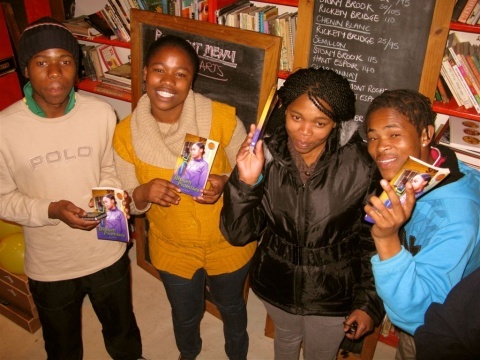 The Ikamvanites have responded amazingly to the book and have spent hours engrossed in the teenage trials of Ntombi. The dramatization of the scene was hugely popular with the Ikamvanites and the Masi community at the initial launch. The ‘Company of players’ then went on to Kalk Bay Books and then to the Franschoek Literary Festival. ‘Their presence added something really special to the launch, and makes us belief that we really are on the right path toward creating a community of readers.’ Author Ros Haden shared her thoughts at the launch. The learners did not display any nerves and performed exceptionally well; addressing real issues with an added humour. There are prospects to take this further and to perform in schools around the area. The Broken Promises fan club must grow and certainly will, if the Masi Ikamvanites are anything to go by!